Passcape Rainbow Tables are used for recovering passwords in Passcape table attack. This tool is intended for creating such tables. Chain Length: affects the probability of finding passwords (e.g. success rate), table generation time and time needed to search for a single password during the attack. Chain Count: affects the success rate, table generation time and its size. At the moment, the table generation tool does not support tables of over 2 GB in size. However, you can create several tables if you are working with very large arrays of data (see the Table count parameter). Success in recovering a password using the tables depends on several factors, and it’s important that you find their best values depending on the size of the tables you work with, their generation time and cryptanalysis time – that is, the time needed for recovering a password during the attack. Maximize password lookup efficiency: allows you to generate more wordprints from the source wordlist by adding numbers, keyboard, and frequently used combinations. This option works well with small wordlists. 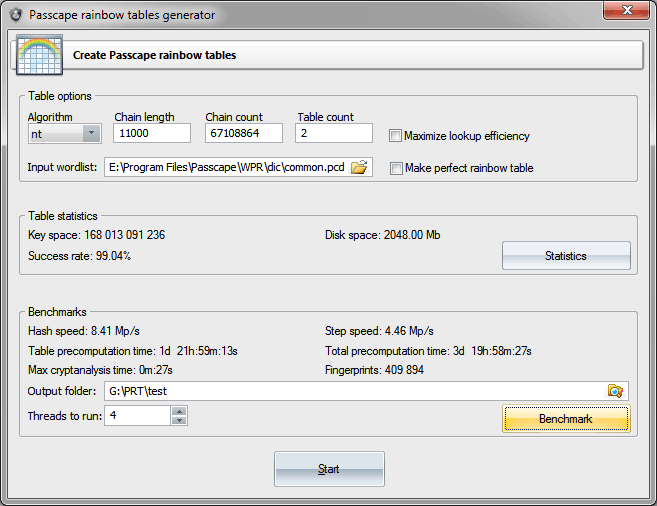 Make a perfect rainbow table: as you may know, password chains in rainbow tables can merge. It means that there is a waste of information, time and disk space. This option allows you to create the so-called 'perfect tables' with no merged chains. Perfect tables occupy considerably less disk space and make password recovery a bit faster. However, the payoff for these advantages is a lower success rate in password recovery. To compensate for this lower success rate, you should at least double the number of password chains and increase the number of generated tables. The table generation tool supports multi-threading, so make sure to set the necessary number of concurrent threads to be run by the program prior to starting the process.